In 2-quart saucepan, mix all the Ham ingredients except the shaved deli ham. Heat to boiling; boil 5 minutes, stirring occasionally. 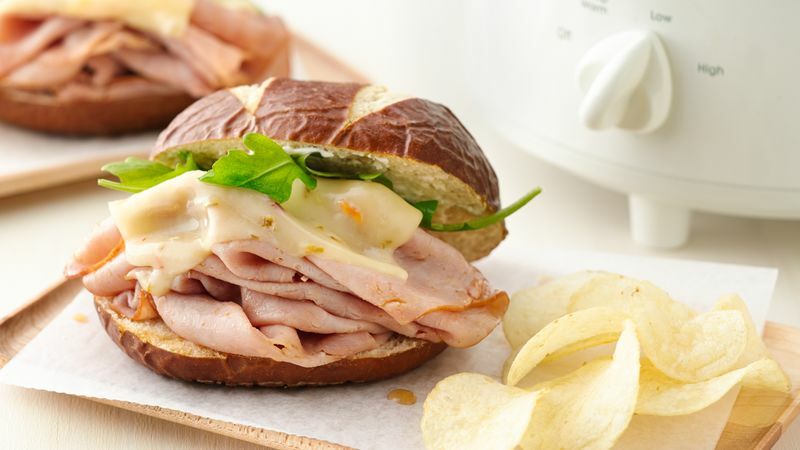 Place shaved deli ham in 3 1/2- to 4-quart slow cooker. Pour boiled liquid on top of ham; cover and cook on High heat setting 2 hours. Use fork or slotted spoon to transfer ham to rolls. Top ham immediately with a slice of cheese and arugula. Spread mayonnaise in tops of rolls, and place on top of arugula. Serve immediately. Swap the pepper Jack cheese with your favorite type of cheese, such as Swiss or sharp Cheddar.